A side interest in the lab is to use what we know about vision to understand some of the discoveries artists have made about how we see. The separate processing of color and form information has a parallel in artists' idea that color and luminance play very different roles in art (Livingstone, Vision and Art, Abrams Press, 2002). The elusive quality of the Mona Lisa's smile can be explained by the fact that her smile is almost entirely in low spatial frequencies, and so is seen best by your peripheral vision (Science, 290, 1299). These three images show her face filtered to show selectively lowest (left) low (middle) and high (right) spatial frequencies. We have been looking at depth perception in artists, because poor depth perception might be an asset in a profession where the goal is to flatten a 3-D scene onto a canvas. We found evidence that a surprisingly large number of talented artists, including Rembrandt, might be stereoblind (Livingstone and Conway, 2004). 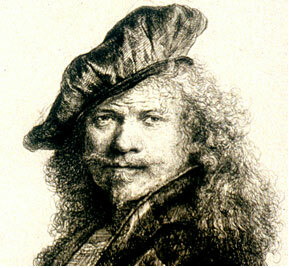 In the etching to the left you can see that Rembrandt portrayed himself as strabismic (with misaligned eyes). Srihasam, K, Sullivan, KJ, Savage, T, and Livingstone, MS (2010) Non-invasive functional MRI in alert monkeys. Neuroimage, May 15;51(1):267-73. Epub 2010 Jan 29. Freiwald WA, Tsao DY, and Livingstone MS (2009) A face feature space in the macaque temporal lobe. Nature Neuroscience 12: 1187-1196. Libedinsky, C, Savage, T and Livingstone, M (2009) Perceptual and physiological evidence for a role for early visual areas in motion-induced blindness. Journal of Vision 9:1-10. Tsao, DY and Livingstone, MS (2008) Mechanisms of face perception. Annual Review of Neuroscience. 31: 411-437. Tsao, DY, Freiwald, WA, Tootell, RBH and Livingstone, MS (2006) A cortical region consisting entirely of face cells. Science,311:670-674. Conway BR, Kitaoka, A, Yazdanbakhsh, A, Pack, CC and Livingstone MS (2005) Neural basis for a powerful static motion illusion. J. Neurosci. 25:5651-5656. Livingstone, M.S. and Conway, B.R. (2004) Was Rembrandt Stereoblind? New England Journal of Medicine 351: 1264-1265.